EMLA will be closed from Dec. 23 through the New Year's weekend so Joan and I can relax, enjoy our families and friends, and read read read! (We might also be preparing a New Year's surprise for the agency, but shhh, don't tell.) We hope the rest of 2010 is warm and bright for all our clients, editors, colleagues, readers, and all, and we look forward to many happy things to come in 2011! 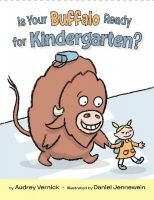 As the year winds down, there's nothing like a nice jolt of editor excitement to keep things interesting—and that's what happened with Is Your Buffalo Ready for Kindergarten? author Audrey Vernick's newest picture book, Edgar's Second Word, over the last few days. Audrey's Clarion editor, Jennifer Greene (who is already hard at work on her nonfiction picture book Brothers at Bat, which will debut in spring 2012, illustrated by Steven Salerno, and on her debut novel, Water Balloon), fell in love with Edgar, whose first word is an emphatic and repeated "NO! ", and his big sister Hazel, who just wants a brother who will share her passion for books and stories, and so we end the year knowing one more book will be hitting shelves soon. Incidentally, Audrey's sequel to Is Your Buffalo Ready for Kindergarten?, Teach Your Buffalo to Play Drums, now has some sample pages available for viewing on the HarperCollins online catalog (click on the "extras" tab and scroll down to links to additional spreads), and there's a giveaway going on at Goodreads for a couple of advance copies! Congratulations, Audrey, and happy holidays! We’ve got some terrific news to share for one of our most youthful EMLA clients: with one week before her 18th birthday, Vahini Naidoo has just accepted an offer for her currently untitled dark, edgy YA thriller about a girl named Ella, who is desperate to understand what could have driven her best friend Amy to jump off a roof to her death. Even worse, Ella can’t remember a thing about the time leading up to the event—and gradually she starts to suspect that those around her know more about that night than they are letting on. Was Amy’s death really a suicide? Or did something more sinister happen…something her best friends are desperate to keep her from ever finding out? This is a fast-paced, edge-of-your-seat psychological mystery, and will keep you guessing right up until the end. North American rights were acquired by Marilyn Brigham at Marshall Cavendish, for a Fall 2012 release. Congratulations, Vee! Trigger and My Big Fat Manifesto author Susan Vaught's Riggador, in which a privileged NYC teen with a kleptomania problem is swept into a love triangle with two intriguing brothers who are fighting for leadership of a secret society of modern-day pirates, again to Victoria Wells Arms of Bloomsbury Children's, for publication in spring 2012. Many people don't know that Susan lives a secret life, under another name, writing bestselling adult romance novels. It's going to be terrifically fun to see her put those chops to work along with her expertise in writing about troubled teens in this new novel. Susan's Before I Knew You, which was originally announced with the former title Lost in Space and involves a teen guy living with the repercussions of "sexting" gone wrong as he moves into adulthood, will be released in fall 2011 from Bloomsbury. Sometimes good news can be shared very quickly, and other times there are hoops of one sort of another that have to be jumped through first. This is one of those latter cases. However, after several months of keeping very quiet, the time has now come to announce some very exciting news: the inimitable Mike Jung’s middle-grade novel, Geeks, Girls, and Secret Identities, has been sold to Arthur Levine of Arthur A. Levine Books! This hilarious action-filled caper is packed with all sorts of zany characters: a muscular guy in spandex, a really big robot, a loudmouth supervillain, a girl who knows karate, and three dorky guys with small biceps and big dreams. It’s got everything you’ve come to expect from reading Mike’s blog and status updates—and much, much more. Keep an eye out for this release as it’s one you won’t want to miss! Jillian Anderson Coats is a relative newcomer to EMLA, and she has shot right out of the starting gate with a lightning-quick offer on her YA historical novel, Without the Walls, which was just bought by Reka Simonsen, to be part of her brand new list at Harcourt. Set in 1293, Without the Walls is the story of sixteen-year-old Cecily de Edgeley, who feels that her life is completely ruined when she has to move to Caernarvon, in occupied Wales. It’s also the story of the downtrodden Gwenhwyfar, now a servant in the house she once dreamed of owning. While Cecily struggles to learn the local customs and to find her place amongst the snobby English landowners, Gwenhwyfar struggles just to survive. And meanwhile, the Welsh are not as conquered as they seem. Outside the city walls of Caernarvon, tensions are rising ever higher—until finally, inevitably, they must reach the breaking point. This gorgeous novel will be heading to the shelves in Fall 2012—I, for one, can’t wait!